ICCS-EM & ICCG –E Lent 2018 TOOL 2. The need might not be our own, for human use. But any species might be part of a larger fabric, a greater intention. Some might complain about the rights of human beings to exist over and above other creatures. I don’t think the Bible or Pope Francis suggests this as a value to itself. LS 33 invites us to look deeper, to move beyond using something or some creature to use it up. Will our identities be inevitably distorted by a culture of individualism, consumerism, and superficiality or transformed by a personal list understanding of which we truly are recognition that we are all children of God, each uniquely made, with equal, infinite worth and intrinsic, immutable dignity, called to communion with God and one another? 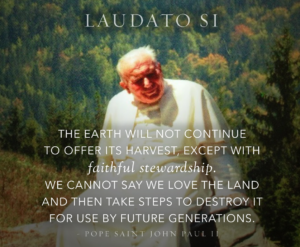 For us as Christians the loss of biodiversity should be very concerning. Our ecosystems are being disrupted and more and more of God’s creatures are becoming extinct by our human actions. Maybe not through our personal and direct human actions, unless we hold positions of power and/or influence, but by our lack of effort to preserve and protect these creatures. Our lack of concern and lack of movement against the actions that bring about the damage and destruction of ecosystems is the root cause of the loss of biodiversity. For you and me, it means that we need to make the loss of biodiversity our personal concern and take the time and effort needed to think about what we can do about such a big picture problem. Lent is the perfect time to strip away the ephemeral and unreal, to free ourselves of the objects and habits that block our path to communion with God and others. It is the perfect time to become children of the light: radiating goodness, truth, and righteousness, spreading joy and hope, and bearing witness to the God of love. And by turning from the darkness, we might help others to see the Way by reflecting the light of Christ’s illuminating presence and redeeming love. Below Link for the Biodervisty Tips by the European Commission , you can right down these 52 Tip each on small paper & let every scout , Guide take one & do it during the Lent In it they share a weekly habit changing tip we call can do to help preserve biodiversity at home and around the world. 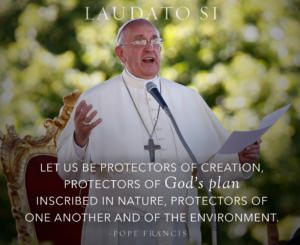 For us, this is a good time to step back and think about what the Pope wants us to understand about our condition as creatures and our part in the bigger picture of ecology. We aren’t just another animal among all of God’s animals because he has given us unique dignity and reason. And because of these gifts, he expects us to use them to follow his commandments and care for creation including care for the good of our families and all other people. the Pope has just touched the surface on the topic of “the quality of human life and the breakdown of society.” As we get deeper into the encyclical, he challenges us more, but for now he directly points out our need to enjoy and participate in nature and the dangers of digital and social media. Put away the electronic devices to enjoy time and talk with your family. Ignore the day’s news and talk about the current events happening in the lives of the family around you. Even if it’s just you at home, turn off the TV and go for a walk, especially if you find yourself frustrated or upset with the news you read online or becoming too involved in what is happening on social media. Pope Francis is trying to draw our attention outside of our own experience. He is asking us not just as individuals, but as citizens of a nation to acknowledge and accept the inequality that exists throughout the world and to understand that we can’t ignore and damage other countries for our own benefit. The policies and business practices of our nation can either positively or negatively affect the health of other countries and we must be responsible for our own actions, as well as help underdeveloped countries to implement policies to protect themselves. We need to re- educate people with facts regarding the the overpopulation myth, the dangers of overconsumption, and the damage done by exploiting underdeveloped countries for the advancement of our own. When looking at global issues, it’s often too easy to ignore the problems of nations and people outside of our own experience. Or even worse, we take on an attitude of extreme nationalism that leads us to believe that we need to “take care of our own” at all costs and let the others ‘over there’ take care of themselves. These kinds of attitudes make a difference, but in a very negative way. 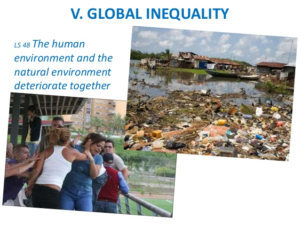 we need to make any real difference towards the problems of the world, now including global ecological inequality, we have to start with changing our hearts, our minds and our attitudes to remember that we, as Christians, are called to care for “the least of these” (Matthew 25: 31-46). When we align our attitudes with the Christ of the Gospels, it is much easier for us to see that we can’t ignore the ‘big picture’ and be must concern ourselves with the policies and practices of our country. We can, with our voices and votes, make a difference by choosing leaders who also live with “the mind of Christ” (1 Corinthians 2:14-16) and through their representation protect the vulnerable. 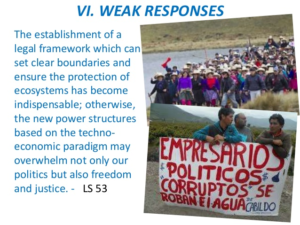 We must hold our representatives accountable and give them the expectation that global solidarity and concern for the poor is not an option, but a responsibility. If you can, become a Big Brother/Sister and take a young person out who may not have the opportunity without your help. Take them on a bike ride, skiing, or boating. Volunteer to help at a nature camp for children/people with disabilities. Take your elderly parents, grandparents, or other family members out for a walk, a drive or a picnic. Spending time outdoors with people, who may need a little help, can be a small sacrifice for you and can mean the world to them! 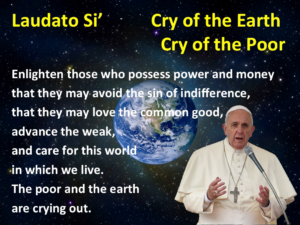 Pope Francis is attempting to help us open our eyes and see just how damaged the world has become. He challenges us to see our part in the destruction, both as individuals and nations, and calls us to do something about it. So, what does it mean for you and me? First it means we need to stop denying the destructive role of humans on the environment, accept the leading science that man-made global warming is real (or at least humans contribute to the unsustainable rapidification of natural global warming) and to seriously consider and act on our moral obligation to change our lifestyles to counteract the problem. Remember that you are a loved, child of God and we can and should take time to completely unplug from TV, news, all social media, our computers, tablets and phones. It’s important that we take time for Eucharistic Adoration, scripture study, devotional reading and prayer. Go to a weekday mass. Pray the Rosary and Divine Mercy Chaplet. Sit outside and experience God in the silence of the wind, the warm sun, and detox in the beauty he created for us! Easter sermon, all are invited to the feast: “Let all then enter the joy of Our Lord! Both the first and the last, and those who come after, enjoy your reward! Those who have kept the fast and those who have not, rejoice today, for the table is richly spread. Let no one cry over his poverty, for the universal Kingdom has appeared! Let no one mourn that he has fallen again and again, for forgiveness has risen from the grave. For Christ, having risen from the dead, is become the first-fruits for those who sleep. to Him be glory and power forever and ever!